There is one universal truth when it comes to ecommerce: each day new companies are entering the retail ring. The size of your business doesn’t matter; neither do the products you sell. Retailers are always working to pull consumers away from your brand and towards their own. To drive new business, increase brand loyalty, and truly wow shoppers, you’ve gotta be creative. Particularly when it comes to email marketing. Email is one of the most cost-effective techniques for getting in front of shoppers and has an incredible 4400% ROI. There’s just one problem: the average inbox receives nearly 90 emails every day. So while standing out in crowded inboxes can be difficult, it’s not impossible. Here’s how you can personalize emails to boost your ecommerce marketing. Even though customers won’t be surprised to see your holiday promotional emails in their inbox, they’ll probably still appreciate the heads up about an upcoming sale or the promo code for 10 percent off their next order. However, the email isn’t likely to make them feel particularly special or VIP-esque. But remember: it isn’t enough to simply shoot someone an email acknowledging the date of their birth. You need to offer the customer something worthwhile, something personalized. Most importantly, something they’ll actually want. 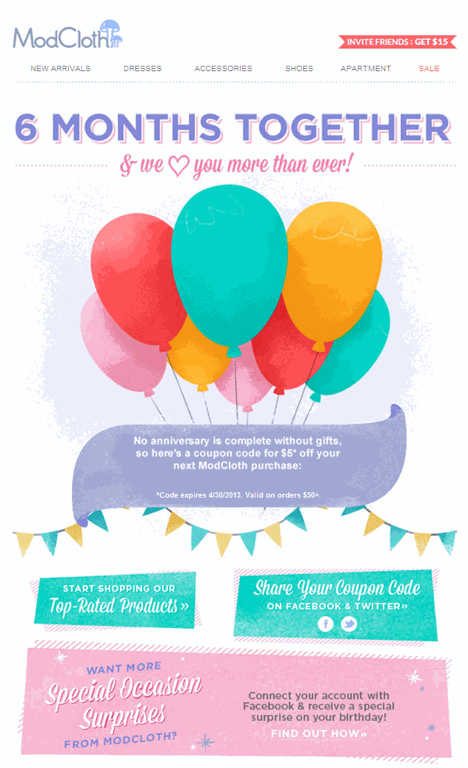 Don’t send a man celebrating his 70th birthday a coupon for free scented bath bombs or a promo code for half off an at-home waxing kit. You’re likely not going to get the outcome you were hoping for. 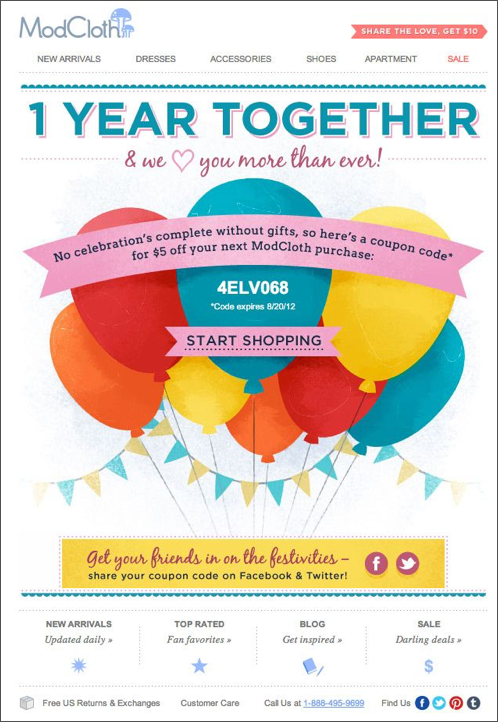 Each of ModCloth’s emails feature a special promo code as well as an invitation to share the code with their friends. It’s an effective tactic for simultaneously fostering loyalty with the brand and expanding its reach. If you want to follow in the footsteps of Amazon’s remarkably successful recommendation engine, include a list of customized suggestions related to recent purchases in your emails. This helps keep the momentum going and encourages the shopper to order more from you. Personalized post-purchase emails don’t have to be exclusively about cross-selling, however. You can also send a post-purchase email that educates the shopper about the item(s) they bought. But don’t explicitly promote additional items in these messages. Rather than trying to inspire an immediate transaction, concentrate on rewarding brand loyalty. 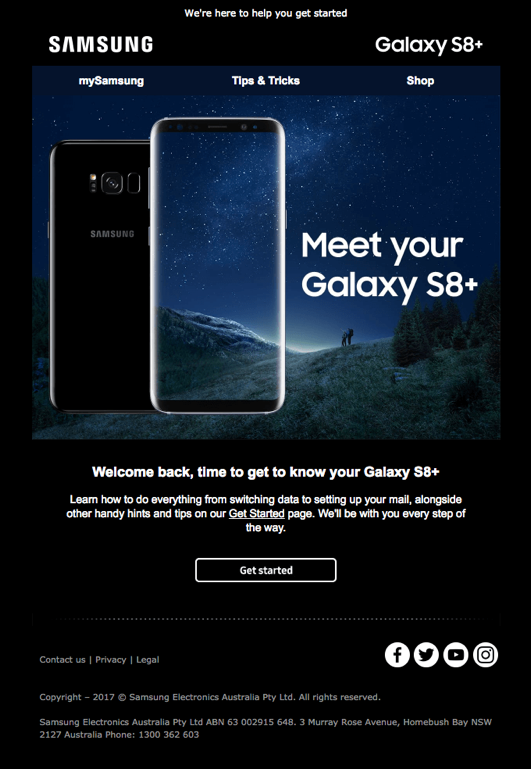 The email content populates based on what the shopper has purchased (in this case, the Samsung Galaxy S8+) and is intended to help the recipient get the most from their phone right out of the gate. Samsung Australia doesn’t use this email to promote cases or chargers or any other accessories. Instead, the brand shows the customer it appreciates their repeat business and is there to assist them as they start using their new phone. Everyday we’re bombarded with more and more new information. In fact, 90 percent of all available data has been created in just the last two years. So it’s understandable that some of us may forget to re-order shaving supplies or body wash until we start to look like Tom Hanks in Castaway. A great way to both improve the lives of your customers and boost your brand reputation is via replenishment emails. Replenishment emails are automated messages sent to customers when it’s time to restock their supply of your brand’s product(s). They can also be used to remind shoppers it’s time to reorder seasonal items such as weed killer or antifreeze. Using replenishment emails is a bit more complicated than some other triggered or scheduled messages. The time between when the order is made and when the item needs to be restocked will vary based on a number of different variables. But as with all ecommerce marketing emails, the key to creating effective replenishment emails is collecting and analyzing data. The more information you gather, the easier it will be to make sure you’re deploying replenishment emails at the most optimal time. Pro Tip: Even if your products aren’t generally consumable, there could be parts of them that are. Or maybe the accessories your customers use with your products could be consumable. Don’t brush off an opportunity to use replenishment emails just because you sell items like kitchen appliances or furniture. 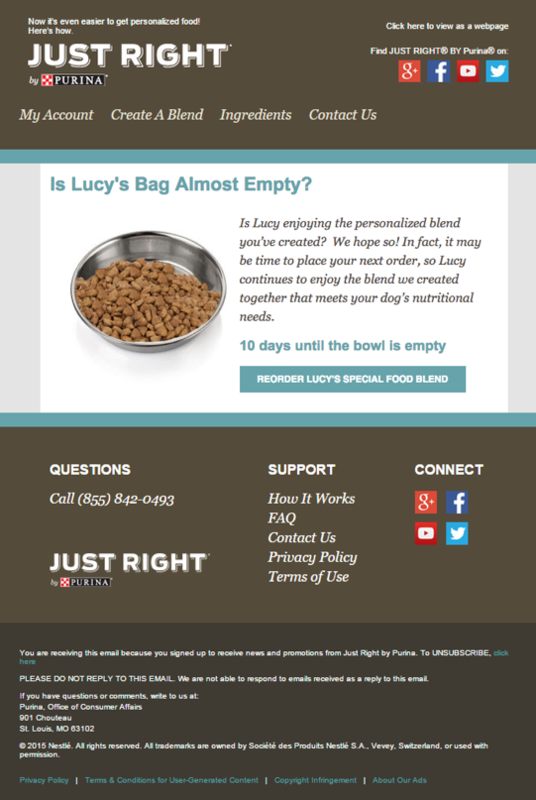 In the email below, Purina takes an emotional approach to the replenishment email. The brand uses the customer’s dog’s name multiple times and tugs on the heartstrings a bit. It’s definitely a powerful email since no one wants to feel like a neglectful fur-parent. One last thing: The goal of using personalization in ecommerce marketing is to build connections with your customers by treating them like human beings. But while you’re humanizing your subscribers, don’t forget to humanize your own brand. Make the sender email firstname@domain.com instead of something generic, such as orders@domain.com. Consider using a more conversational tone in your emails. Consumers are more likely to do business with a brand they can connect to rather than a faceless company.